Four Resolute employees cross Lake Saint-Jean in winter to raise funds for young people with cancer. It is February 10, 2017. 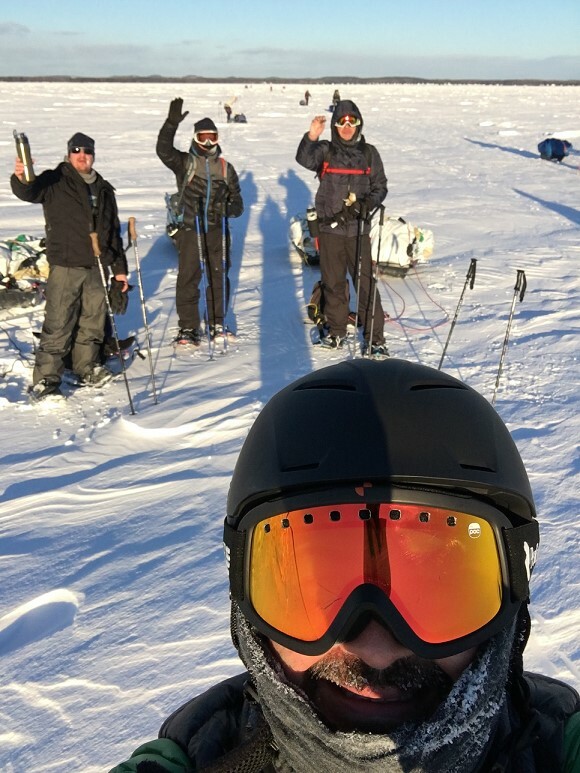 Janic Gaudreault, Stéphane Painchaud, Bruno Taillon and Pierre Tremblay, four colleagues from Resolute in Saguenay–Lac-Saint-Jean (Quebec), are preparing to brave the frigid cold for three days and two nights. They are going to snowshoe across Lake Saint-Jean. Why on earth did they get involved in such an undertaking? The answer: to take up the “Double Mario Challenge”, and potentially change a lot of people’s lives. The double challenge is a fundraising campaign launched nine years ago by two local residents, Mario Bilodeau and Mario Cantin. Their challenge was to ski or snowshoe across Lake Saint-Jean, attracting interest from donors in the process. 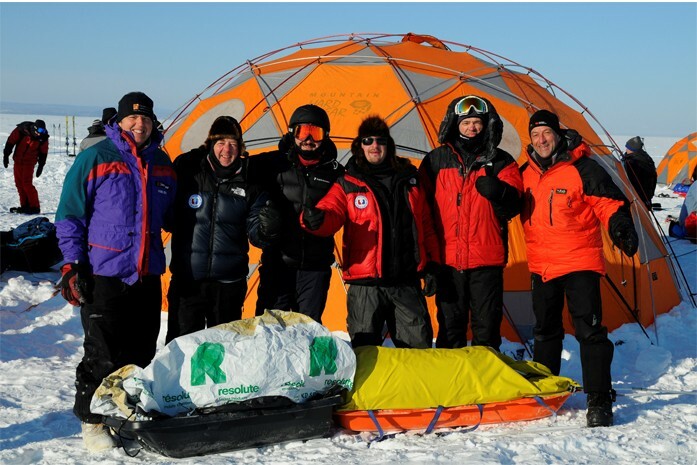 This year’s event was held from February 8 to 12 and involved about fifty participants in two expeditions. Only the event organizers did the return trip twice, with both groups. For them, it was the full Double Challenge… and their most difficult one in nine years. On February 10, the Resolute team was with the second wave of 35 participants starting out from Pointe-Taillon National Park and heading for Roberval. After sharing a few bites of hot tourtière, the group started off on their adventure to applause. They were on their way! It was Janic who originally suggested the idea to his colleagues. Bruno came on board immediately and a phone call convinced Stéphane and Pierre to put on snowshoes too. They didn’t expect it to be quite so challenging. A lot of snow had fallen a few days before the group set out, and the teammates had to deal with extremely cold weather. Although the mercury stayed around -16°C during the day, nighttime was another story entirely. The participants camped 12 to a tent and absolutely had to conserve heat in their sleeping bags… but not breathe in them to avoid dampness! Stéphane Painchaud shivered all night and Bruno Taillon says he didn’t sleep at all. “The cold is enemy number one!” he said. After a second exhausting day and another night at -35 degrees, only seven kilometres remained to go. Proud and tired but radiantly happy, the Resolute crew finally crossed the finish line after three days of walking on ice. Every Double Challenge participant raised funds for the On the Tip of the Toes Foundation that helps young people with cancer enjoy great experiences on therapeutic adventure expeditions. Since the adventurers returned, some fifteen colleagues have expressed interest in the next Double Challenge. When asked if they would repeat the experience themselves, the four teammates were agreeable to the idea. “But maybe not next year,” laughed Bruno. To learn more about the On the Tip of the Toes Foundation, visit this page. Flanked by the Double Challenge organizers, Mario Bilodeau and Mario Cantin, the Resolute team is in the centre: Janic Gaudreault, manager, Human Resources, Woodlands and Sawmills, Lac-Saint-Jean; Stéphane Painchaud, manager, Girardville Sawmill ; Pierre Tremblay, superintendent of Operations in Larouche; and Bruno Taillon, regional controller.